Wilson during his tenure with the Patriots. Eugene W. Wilson, II (born August 17, 1980) is a former American football safety. He played college football at Illinois and was drafted by the New England Patriots in the second round of the 2003 NFL Draft. Wilson has also been a member of the Tampa Bay Buccaneers and the Houston Texans. He earned two Super Bowl rings during his tenure with the Patriots. Wilson attended Merrillville High School in Merrillville, Indiana and lettered in football and basketball. In football, he was a two-time All-State selection and, as a senior, he was named the Conference's Defensive Player of the Year. In basketball, he was a four-year varsity letterman and starter and was a two-time All-Conference selection. Wilson attended the University of Illinois where he majored in speech communications. He finished his career with 176 Tackles (139 Solo, 37 Assist), 11 INT, and 60 PD. He also had 93 punt returns for 896 yards and 2 TD. 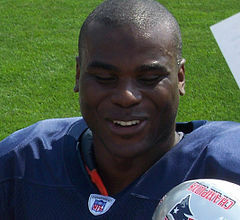 Wilson was drafted by the Patriots in the second round (36th overall) of the 2003 NFL Draft. He helped the Patriots win Super Bowl XXXVIII in 2003 and Super Bowl XXXIX in 2004. He recovered a fumble by Philadelphia Eagles tight end L.J. Smith in Super Bowl XXXIX before leaving the game after sustaining an injury on a kickoff. He also intercepted Pittsburgh Steelers quarterback Ben Roethlisberger twice in the Patriots 41-27 victory in the 2004 AFC Championship Game. In 2007, in a Week 15 game against the New York Jets, Wilson returned a Kellen Clemens interception for a touchdown, making him the 21st Patriot to score a touchdown that season, tying an NFL record. On March 14, 2008, the Tampa Bay Buccaneers signed Wilson to a one-year, $1.8 million contract including $500,000 guaranteed. However, Wilson was released on September 1, 2008. Two days after his release from the Buccaneers, Wilson was signed by the Houston Texans on September 3, 2008. During a preseason game against the Minnesota Vikings on August 31, 2009, Wilson fell victim to an illegal "crackback" block thrown by Brett Favre. He was injured on the play and was listed as "day-to-day". Wilson returned to the field on September 20, 2009 and started the second game of the season, recording an interception in the Texans' win over the Tennessee Titans. Wilson was placed Injured Reserve on November 24, 2009 due to broken toes. On February 18, 2011, the Texans released Wilson. ^ "Player Bio: Eugene Wilson". Fightingillini.Com. August 17, 1980. Archived from the original on February 5, 2012. Retrieved December 17, 2011. ^ "Eugene Wilson Stats". ESPN. ESPN Internet Ventures. Retrieved September 22, 2014.